AUSTIN, Texas, May 23, 2017 /PRNewswire/ -- Drillinginfo announced today it has expanded its international platform and state-of-the-art data analytics tools used to identify and tap lucrative oil and natural gas plays outside U.S. markets. The DI International platform follows the same principles as its U.S. model which has earned Drillinginfo a reputation as the oil and gas industry's leading SaaS and data analytics company. It integrates all of its international datasets into one platform creating a whole that is truly greater than the sum of its parts. And it's mobile. The result is the most relevant and actionable opportunities across the globe for energy professionals and companies to focus on closing deals and delivering value to their bottom line. "The world's oil and natural gas – not just that of the United States – is at our fingertips," remarked Allen Gilmer, Chairman of Drillinginfo. "While the logistics may be different in other countries, the data and understanding the geology can be normalized. DI International is ready to take on the world," continued Gilmer. "In less than ten years, the U.S. shifted its focus from importing energy to exporting. It unleashed an energy resurgence that changed our nation in every capacity possible. As the industry now looks at ways to export hydrocarbons to other nations, from both a markets and energy security perspective, we also have an opportunity to export our ingenuity," added Gilmer. "Just like in other commodities, we can export our goods and our intellectual property." Drillinginfo analysts span the globe and provide industry leading market intelligence in nearly 200 countries covering the Middle East, Africa, Asia, Australia, North and Central Europe, and Latin America, with access to exclusive opportunities and expert predictions on future activity. DI International delivers the who, what, where, when, and why of the oil and gas industry with a complete view of global asset transactions and unique forward-looking datasets such as potential and planned farm-ins, bid blocks, and wells. Whether exploring events, operations, or production in a specific country, gathering competitive intelligence, or deciding to invest in specific blocks, the Drillinginfo platform was designed to support companies seeking to minimize risk and maximize business performance. At a recent Global Insights event, several attendees indicated the DI International platform would likely change the way they view opportunities outside the U.S., including one representative from a super major complimenting the intuitiveness and accessibility of the web and mobile app which allows for a broad adoption across the organization. Bruno Pina, Geoscientist at Galp Energia said, "One of the most important advantages is the ability to create easy-to-use digital maps that enable our staff to see what data is available to them, reducing drastically the amount of time looking for the information they need to do their work." 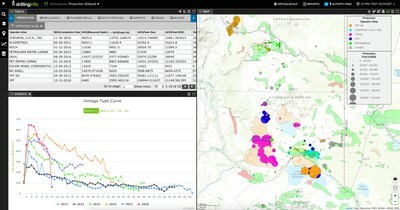 Melissa Johansson, Principal Geologist at Geode-Energy, also commented, "I can see a real use for this app to organize and present information regarding current activities in my areas of interest and deliver it right to my phone." A full list of DI International capabilities can be found at drillinginfo.com/products/di-international-products and parties interested in a free demonstration of DI International can sign up at http://go.drillinginfo.com/international. Drillinginfo is the leading energy SaaS and data analytics company that provides predictive tools and technology to drive exploration decisions, evaluate rapidly evolving opportunities and achieve better, faster results. The company delivers actionable intelligence over mobile, web and desktop platforms to analyze and reduce risk, conduct competitive benchmarking, and uncover market insights. Drillinginfo serves more than 2,500 companies globally from its Austin, Texas headquarters and has more than 400 employees. For more information visit drillinginfo.com.